The pre-history occupation here spanned from 13,000 BC to 1670 AD. This area has the oldest artifacts and fluted points yet discovered in America and is also said to be the longest occupied settlement in America. Someone has either lived or hunted this area at the mouth of the Coal River for over 15,000 years. These Native American cultures included the Adena, Ft. Ancient, Moneton and Shawnee. The first known white man to enter the Kanawha Valley was Gabriel Arthur in 1674 when he met with the Moneton tribe. The Shawnees continued to visit to hunt and make salt in this area until the 1780’s, often attacking white settlements here. Explorer John Peter Salley discovered the Coal River in 1742 on his expedition from Virginia to New Orleans. He named it the Coal River for the vast outcroppings of coal he saw. In 1756, Samuel Cole, while on a military expedition, “re-discovered” the Coal River and for many years it was also called the Cole River. Surveyor Christopher Gist visited the area in 1751. In 1755 Mary Ingles passed through here from her escape from the Indians. Frontiersman and Indian fighter Simon Kenton hunted here and lived a short time in the upper Kanawha Valley in 1771. 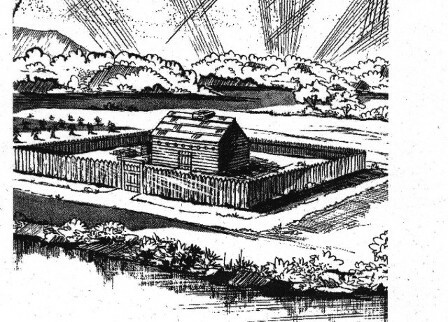 The first permanent settlers near St. Albans, called Coalsmouth, arrived in 1786 with the building of Ft. Tackett about 1788, which was actually about 2 miles below present St. Albans. After being burnt by the Shawnee Indians in 1790, the settlers moved upriver to Charleston (Ft. Lee). Before then, vast virgin timber forests, buffalo and Indians trails preceded the White man in this area. Thirty-one people lived there in 1790. In March of that year the Shawnee Indians attacked and captured two settlers and took them to Michigan. The two captives eventually escaped and returned to this area. Six months later the Shawnee attacked again and they killed Christopher Tackett and several children, kidnapped eight others and burned the fort. At least two were killed later by the Indians and the other taken to Huron and most managed to eventually escape back to the Kanawha Valley. Several hid from the attack and managed to escape to Ft. Lee, later Charleston. The first white child born in the Kanawha Valley, Jacob Tackett, was born here to Kizah Tackett Young. Daniel Boone wrote in 1791 “from Pt. Pleasant to Elk (Charleston), no inhabitance. He referred to this fort as Coal Fort. The land where St. Albans stands was once owned by George Washington (2,000 acres) and purchased by him from Lt. Charles Thurston for his service in the French and Indian War. William Crawford surveyed it in 1774. Washington’s “Cole River” property was willed to his niece Elizabeth Spotswood, daughter of Augustine Washington. Morris Hudson bought 400 acres of the eastern part of the property from her in 1810 and became the first settler in present St. Albans. His nephew, Samuel Washington, also owned land nearby (Dunbar) and resided in Coalsmouth and is buried there at Bangor Cemetery. Philip Thompson bought over a 1,000 acres from Mrs. Spotswood along the Coal River in 1816. Another earlier settler was Thomas Teays who was granted 27,000 acres in 1781 from West of the Coal River to present day Teays Valley. He was captured by the Shawnee in 1782 but managed to be set free when one of the Indians recognized him as giving him salt during a hunting trip. He left the area due to the Indian turmoil. However his son Stephen built a double log house on the West side of Coal River in 1793. It was on Teays land that Ft. Tackett was built. The “old state road” was built from Ft. lee to Pt. Pleasant in 1804 and Stephen Teays built a ferry at the Coal River crossing and inn to feed, lodge and supply those who were brave enough to travel the road. Phillip Thompson also purchased land from Spotswood (1,000 acres) near the Coal River and moved his family here in 1816-1817. He built a large stone house here called Muckmore (near the present day Loop) which survived until 1976. He later developed the "downtown" area and named it Philipi. Mr. Thompson and James Teays built a 180 foot long covered toll bridge in 1831 across the Coal River along the James River and Kanawha Turnpike. Previously the river had been forded or used a ferry. The bridge stood until 1861 when burnt by the retreating Confederates after the battle of nearby Scary Creek. It was a foolish loss as pursuing Union forces could still ford the river. The Teays Inn was also built on the West on the bridge along the turnpike. The first roads in this area were foot trails and Indian and animal trails.The first wagon road through here was called the Old State Road and went to Pt. Pleasant. By 1831 the James River & Kanawha Turnpike arrived in Coalsmouth. It started at the James River in Virginia and followed the Kanawha River. The Covered Bridge across Coal River was built at this time. It was burnt in 1861 during the Civil War by retreating Confederates, after the nearby Battle of Scary Creek. The James River and Kanawha Turnpike road became known as the Midland Trail in 1920 and extended to St. Louis. The C&O railroad arrived in St. Albans in 1871-72 with the first Depot built in 1871 where the current one is located. By 1912, the trolley, or streetcar line, came from Charleston to St. Albans. Phillip Thompson began laying out lots and streets in what was then called Coalmouth in 1832 and a town was born. Due in part from turnpike travelers, business began to spring up. He called his early town at Coalsmouth, Phillipi. Morris Hudson built one of the first churches (Episcopal) in the area in 1822, called Bangor Parish. Samuel Washington, nephew of George and son of Charles Washington, is buried in Bangor Cemetery. He had inherited land that is now present day Dunbar. His son, Samuel T. Washington, Jr., married Morris Hudson’s granddaughter, Wilhelmina. Between 1854-1857, eight stone and log locks and dams were built on the Coal River to Peytona in Boone County and one on the Little Coal River to haul cannel coal. The project engineer was Capt. William Rosecrans (later General0. After a severe flood in 1857, the locks were rebuilt and finally open in 1859. A flood again heavily damaged them in 1861 and after inactivity during the Civil War; they were again rebuilt and reopened in 1867. Cannel coal was the chief product shipped by the locks, which could be made into fuel oil (coal oil) for lamps. Much of it was shipped to refineries in Cincinnati, Ohio and Charleston. The Navigation Company of Coal River ceased in 1881 due in part that cannel coal was no longer needed with the discovery of petroleum. Plus the locks again suffered flood damage several times in 1875-1876. Logs could now be floated down the Coal River to St. Albans to the mills being established in St. Albans. It could be said that St. Albans witnessed boom years not only during the days of the shipping of coal through here, but mainly due to the dozens of lumber and planning mills established from the 1880’s through the 1920’s and the coming of the C&O railroad. Log booms, or log cribbings, were built on the Coal River to contain the logs until they could be processed. After most of the virgin logs had been harvested from the area, the largest lumber mill, Bowman Lumber Company, closed in 1923. Col. John Cunningham (Union) and his father inlaw Stephen Benedict acquired most of Phillip Thompson’s land and in 1857 Phillipi became Jefferson. One year later in 1868 it was incorporated as the Village of Kanawha City. Collis P. Huntington built the C&O railroad through here in 1871-72. Mr. Huntington, being an influential person, proceeded to have the name of the town changed to St. Albans in 1871. Supposedly done as a favor to his chief council, H.C. Parson after his home in St. Albans, Vermont. Approved by WV Legislature January 1872. The citizens were not informed (nor happy) of the name change until after the fact. The Post Office has only used two names: Coalsmouth and St. Albans. The first know school here was in a log church built by Stephen Teays in 1820. Another early school was operated by Rev. F. B. Nash at the Bangor Church in 1845. It burned in 1847 and the school moved to a building aon Main Street. Other early private schools were Fry's school for ladies (1827) and a school for ladies in the late 1840's operated by three Frenchman in the Turner House on B Street. The first public school in town was "Old Town Hall School" (or Swamp College) and it was also used as town hall. It opened in 1867. The first high school in town was formed in 1873 and named Coalsmouth High School (notice they still used the name Coalsmouth). The name was changed to Shelton College in 1877. It finally had to close its doors in 1911 after finally being the St. Albans Latin School. It is located on College Hill and is now a fine restored home. A series of severe fires destroyed most of St. Alban’s Main Street in 1906. With no fire department of its own, fire equipment had to be brought in by rail from Charleston, thirteen miles away. The new structures had to be built of masonry. Most of the buildings survive today and its twenty-seven structures are part of the Main Street Historic District. The Coal River & Western Railway extended up Coal River in 1906 and today is one of the busiest coal railroads in America. The streetcar lines were extended to St. Albans from Charleston in 1913. They were discontinued in 1939 and replaced by bus service. The St. Albans-Nitro Kanawha River Bridge was constructed in 1934 and was replaced in 2013. A Kanawha River ferry also operated in that area for over a hundred years and even continued after the bridge was built for several years as it had lower tolls than the bridge. The water plant was built in 1921 and the first paved brick streets were built in 1918. Only one brick street remains today, on Fourth Ave. in front of the C&O Depot (ca. 1906), The Depot was placed on the National Register of Historic Places in 1997. Teays Hill Cemetery (THC) is a non-profit association founded in 1878. Since the beginning, the Association has always been run by a volunteer board of five members, who give of their time and talents to maintain the cemetery, as many of their family are buried there. St. Albans has twelve (12) sites on the National Register of Historic Places and their Historical Society frequently conducts historic walking home tours. The Archaeological site along the Kanawha River is one of the oldest in the United States with points dating back 9,000 years!! With the closing of the lumber mills in the 1920’s and the short lived Nitro ammunition plant during WWI, St. Albans (approximately 12,000 residents) has become mainly a residential city of the Charleston metropolitan area. Many homes were built here in the 1940’s and later to provide housing for workers at the large Naval Ordinance Plant during WWII (later FMC) in South Charleston and the numerous chemical plants in the Kanawha Valley. Content to provide homes for workers throughout the Kanawha Valley, it is a good place to come home to after a hard day’s work.